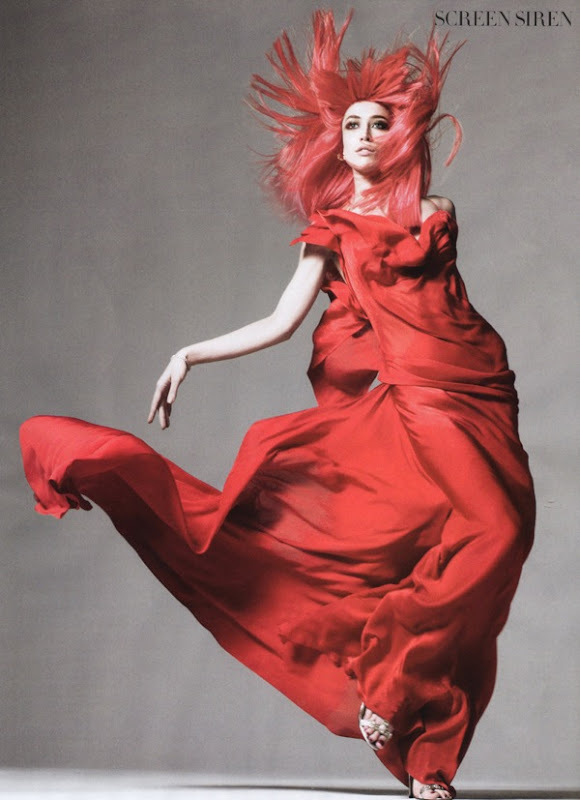 The editorials in the May issue of American Vogue are quite amazing, but was I loved best about the issue was their embrace of bold color statements, especially the rich shades of pinks and oranges. 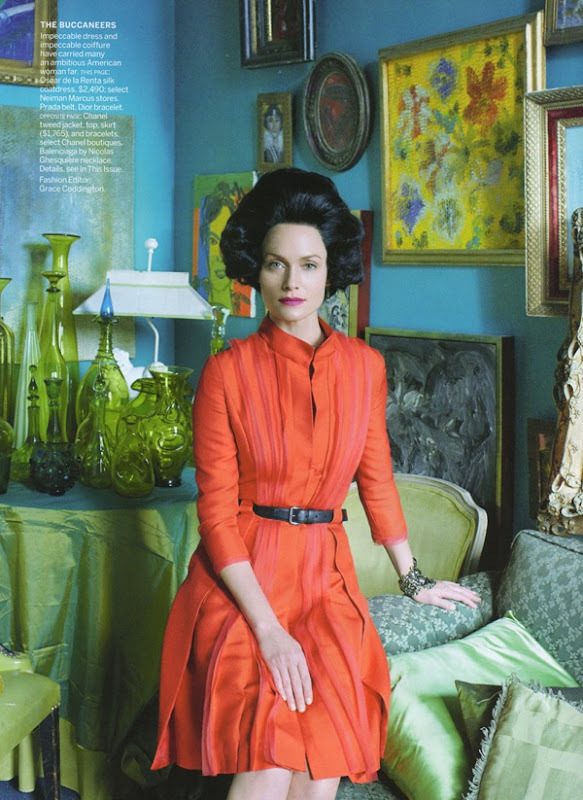 In one of them Steven Meisel shoots Amber Valletta as an old-school socialite with a slew of candy-colored coifs and in one of my favorite shots she sits in a turquoise-decorated room with jet-black hair and the perfect fuchsia lipstick that perfectly complements her dress. For the main editorial about the American woman (aka, the theme for this year Costume Institute exhibit/gala, David Sims shoots a rainbow coalition of IT-models in all the most important designers who have found a new home in popular looks from the past century. The best shot, by far, belongs to a STUNNING Raquel Zimmerman with super bright hair that almost exactly matches her sinuous gown. But what it comes down to is simply, that I'm REALLY feeling these colors. yep, the colours in the room are quite stunning! mediterranean flair... would move into that room. :) love the colour, not orange not red, in the second pic. i hear ya...i fell in love with a velvet dress, same color as in the second pic. some undeserving wench pried it from my hands at the last moment :( true story! ask ebay. The first picture is so classic!I love the second photo, the clothes move freely on the model. Enough of Raquel Zimmerman, please. American Vogue is the only magazine to champion her. Why not give a chance to new, more exciting, more attractive models, anybody from Crystal Renn to Jacquelyn Jablonski. American Vogue is, as always, well behind! She's not seductive. Ruins an otherwise ok picture. woah there! thats so much negative energy in one comment! raquel zimmerman is AWESOME and it's not like only US Vogue uses her, i just posted a killer editorial that Vogue Nippon did with her! Personally i dont't really care for crystal renn or jablonksi, but you know, different strokes for different folks. as for the seductive, well, i dunno, i dont think this picture called for seductive but i think when she needs to, she can definitely pull it off. i love how that first image is styled; the pleating on the dress, the black belt/black hair, the turqoise wall covered in paintings, the two chairs next to each other, the taffeta promdress table cloth and the bottles, lord, the bottles! the only thing is, i wish that she had a little plastic bow barrette clipped in her hair. that would totally seal it for me.